Normally when I start projects, I neglect everything and everyone else, and work my tail off to get things done quickly. But that's not how I did it this time. I started thinking about repainting and rearranging a few months ago. That turned into ripping up the carpet for new flooring- and then my husband got sick, my kids needed me, I got a little cold, we had lots of school and church activities etc etc. So I took my time to finish it. I wouldn't even say that I'm DONE yet (I'm never truly done) but it's far enough now to show. My goal was to lighten it up and add lots of happy color. I started by clearing everything out of the room and putting down vinyl wood tiles. I wish I had done this a long time ago. It was inexpensive and not difficult. I'm not going to lie- it was a long day (but it only took a day) and I hurt like crazy afterward from all the lifting, bending and kneeling. The hardest part was taking up the carpet and fixing the sub-floor to make it smooth enough to lay the tile. But it was soooo worth it. I seriously come in here all the time and just stare at the floor. I love it so! There are a lot of tutorials out there on how to lay these tiles. But if anyone is interested in how I did it, I would be happy to tell you. 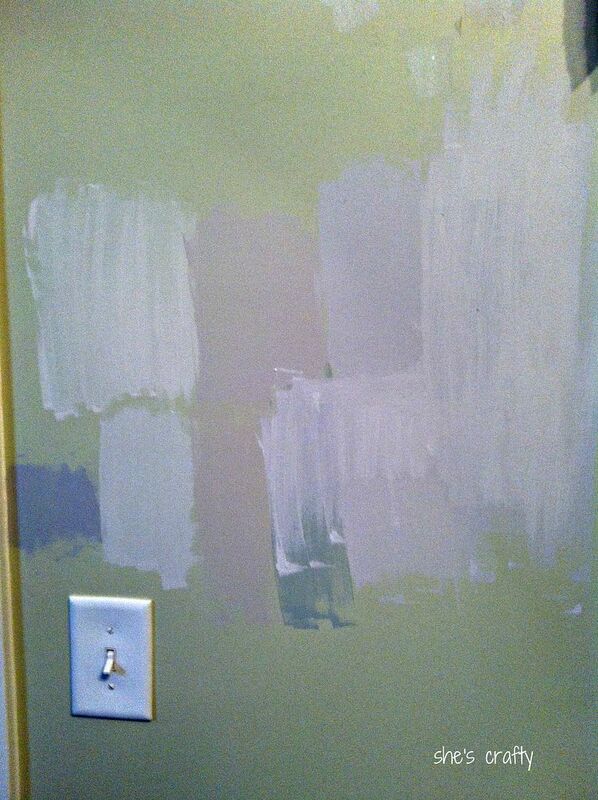 The next step was picking a paint color. Oh my word- I've never had so much trouble picking paint ever. This room has weird light and casts strange tints to the walls. I bought 8 different samples of paint to get the right one. I ended up going with Smooth Stone by Glidden, that I had color matched into Behr paint plus primer. It's the sample on the bottom row, 2nd from the left in the photo (please excuse the poor cell phone pic). It's a nice beige-grey color. I painted a lot of the furniture I already had. The big white cabinet (which houses my printer, paper, die cut machines and kids craft supplies) used to be stained wood. The grey-green cabinet in the back by my desk used to be black. This is the top of the big white cabinet. It's not going to stay like this. I had a bunch of stuff just sitting on the floor so I stuck it up here. I'm for sure going to do something with the yellow canvas but the inspiration hasn't struck yet for that or anything else up here so it will do for now while I figure it out. 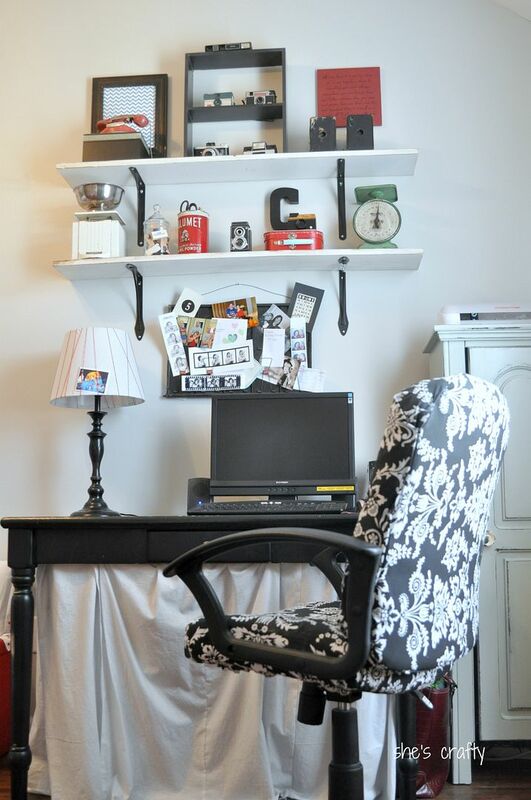 Across the room is this wall- with my new long desk and organizers. Oh my I love it so much! 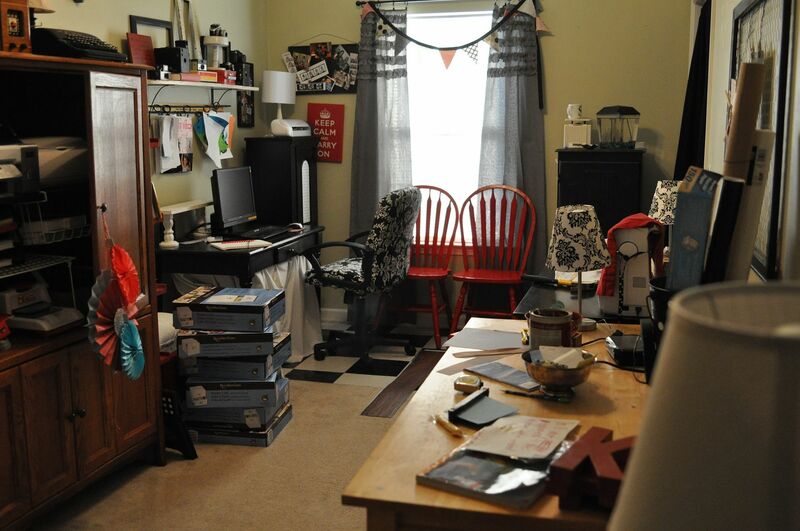 I have so much storage room and so much room to spread out doing crafts. 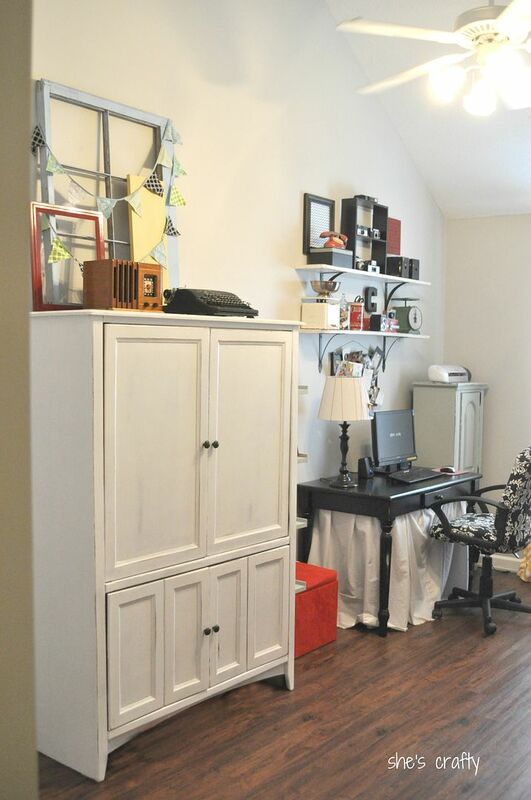 And my kids have a place to do homework or craft projects. I bought the organizers from Michaels (at 50% off). The top is a piece of MDF I had cut from Lowes. The chairs were already in the room. 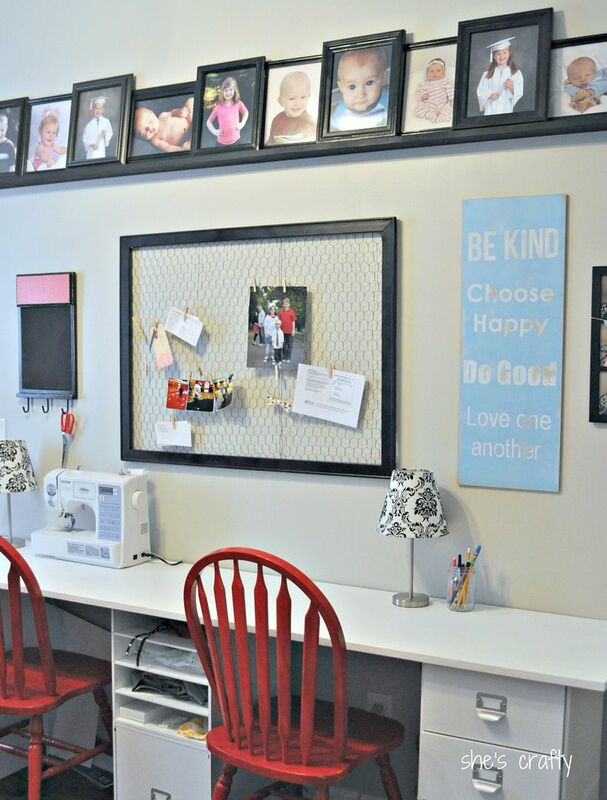 You'll recognize the chicken wire message board and mom pictures framed of my kids. I just finished the wooden blue subway art (will post about that soon). 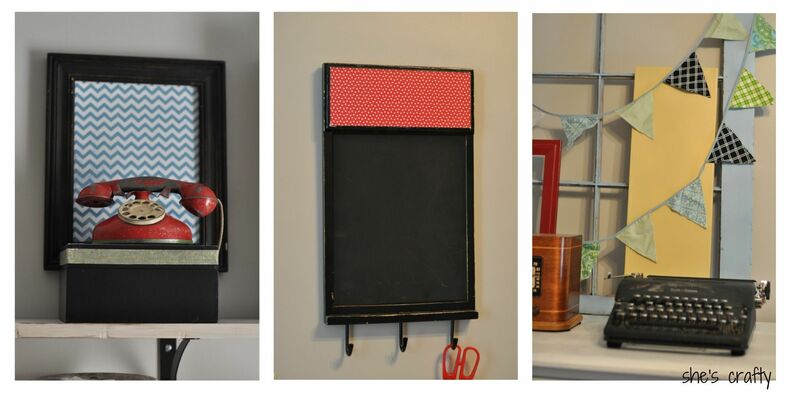 And the chalkboard holder that the scissors are hanging from is from my stash. The lamps are from Walmart. The black curtain on the left is my scrapbook/craft storage closet. I've reorganized that too and will post about that soon as well. This is the desk area with my recovered office chair. It's still holding up perfectly. 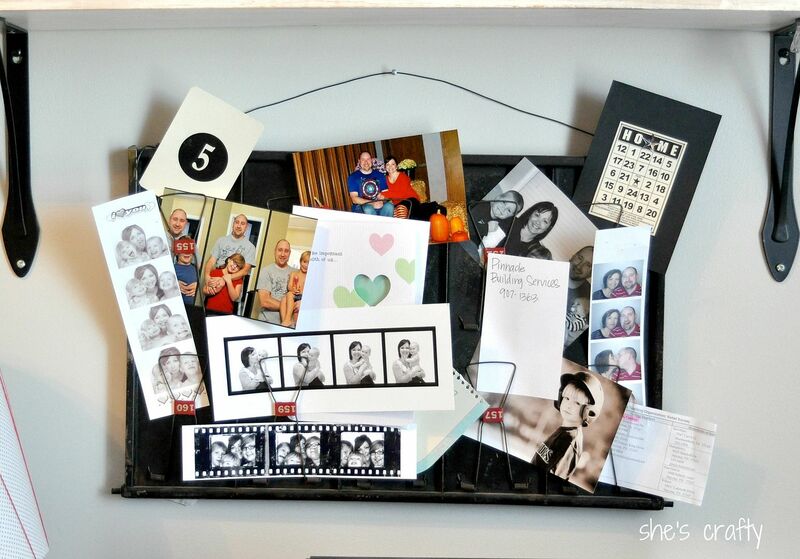 This photo display is an old cash register drawer. I have two stacked shelves above my desk. I'm still working on adding more color here instead of just black and red. Here is the before of the room - I had already started taking it apart to put in the new floor. But still - whoa!! And after! SO much brighter and happy! And a lot more spacious too! Yay! I still would like to get a comfy chair (to put where that red square stool is) for reading or relaxing, a tv/dvd player to watch movies, maybe a new lamp for my desk and some colorful artwork. It looks great! I am really suprised with the floors! They look amazing...I would never know that is wasn't wood or a wood laminate. Great job....I love you color choices in the room. You did an great job! I would love a room like yours, but there are no more rooms in our home. 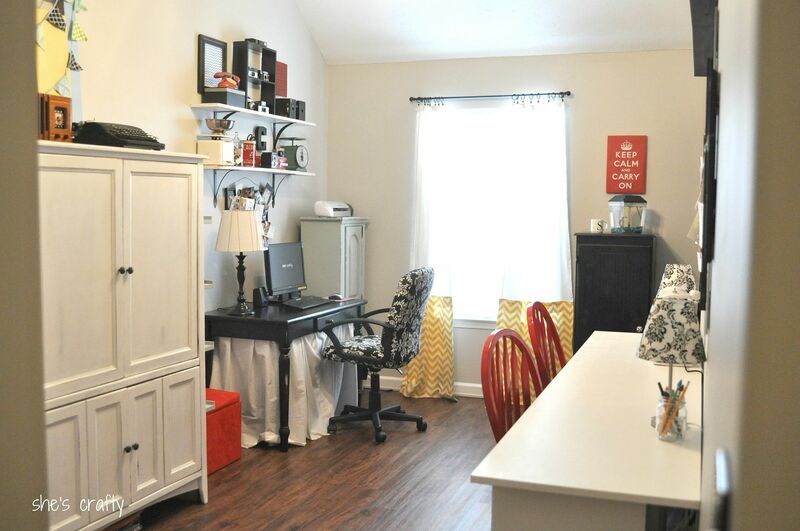 I keep telling my hubby I want to turn the dining room into an office since we only use it at Christmas...right? 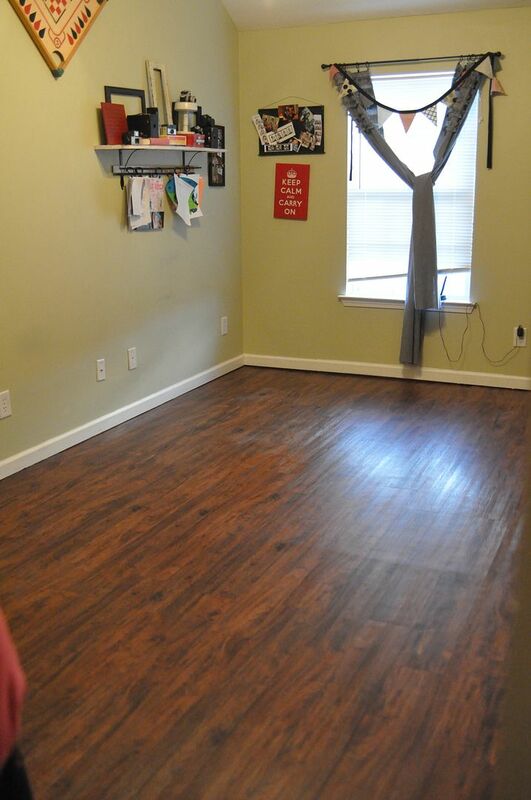 Your flooring is gorgeous, where did you get it and what brand? Is it a laminate like tile? Got me wondering. Looks great Candice! Such a fabulous space- happy creating! Looks fantastic! 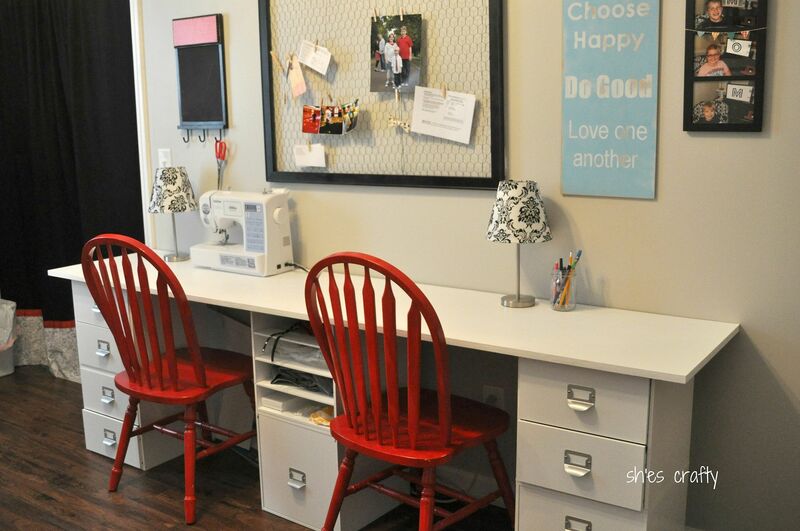 I especially love the pops of red around the room. 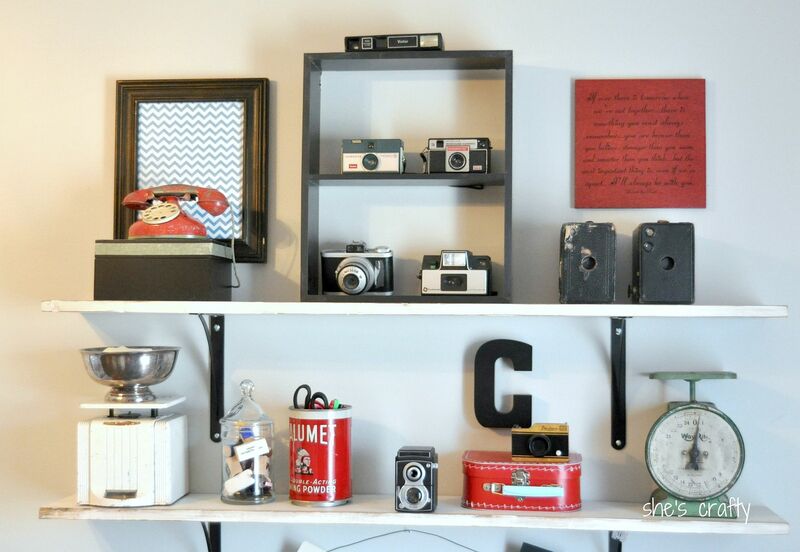 What a fun space in which to create! Looks great! Love the pops of color...especially the RED! 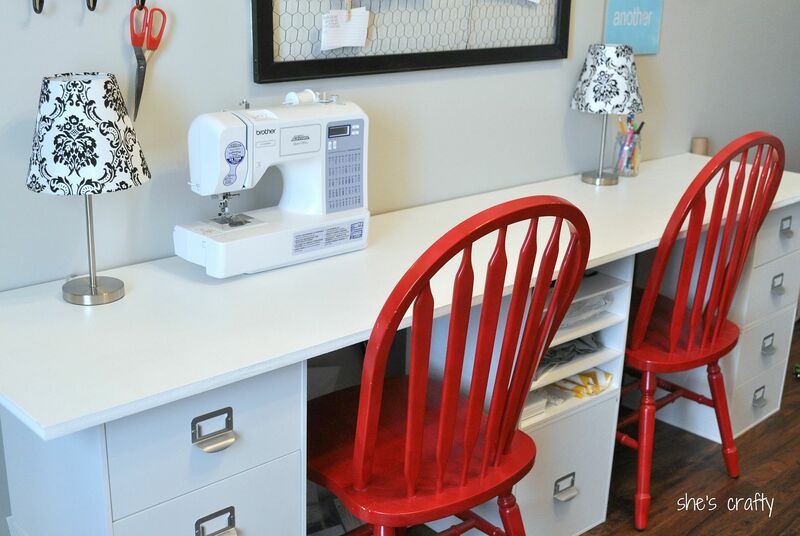 I can't wait to have my own craft room. I'm your newest follower! This looks great, so much brighter! I'd love to have a space like this. LOVE it!!! 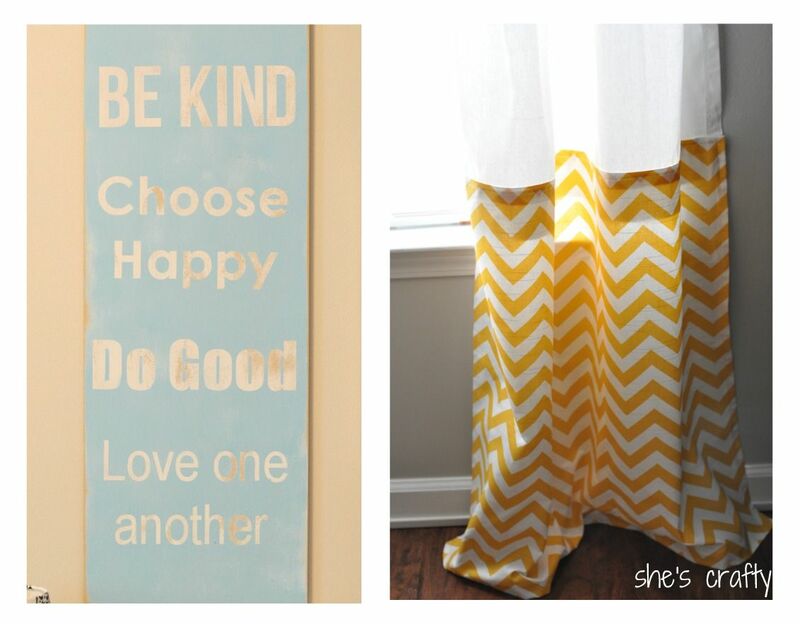 I love the yellow Chevron curtain details and the red chairs!! Great job chica! I'm a new follower and just saw you on TT&J! :) Have a great weekend! Love it! What did you use to paint the cabinet? Was it spray paint or just roll on wall paint? Thanks! I'm so glad you shared this at Sunday Blog Love! 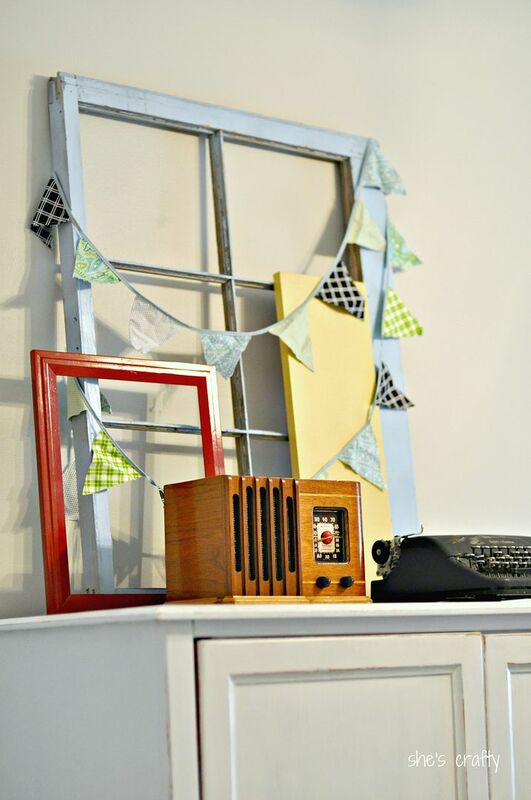 YOur space is so bright and fun looking! This is one of my top picks for the week and will be featured this weekend! Wishing you a wonderful weekend! It's so bright and cheerful, along with being super functional. LOVE it!